Home // Bar Reviews // Bar Reviews // The Curry and Milk Cocktail at Mourad. Do it. The Curry and Milk Cocktail at Mourad. Do it. There have been few drinks in my life that are so good that they distract me from my day-to-day responsibilities, or persuade me into breaking my daily routine. I mean, I'm an adult now, I need to go home at a decent hour, cook a nutritious dinner, and get a solid night's rest...right? Wrong. A visit to Mourad a couple weeks back has made it simply impossible for me to stick to such a mature regimen. Now, the memory of one particular cocktail has infiltrated my thoughts, distracting me while I'm trying to concentrate on say, I don't know, my job maybe? How can I stick to my routine when I'm knee deep in excel spreadsheets at work, or in the middle of a set of squats at the gym, and all I hear is a little voice in my head saying, "Kelsey, you need to stop what you're doing immediately. Finish this last rep of lunges, wrap up that sales report, and start walking towards Mourad. There's a drink - or 4 - waiting at the bar, with your name on it" Day dreaming about a cocktail may not be the healthiest way to live, but after giving into my cravings, I can say it's certainly the most delicious way to live. So what is this drink that's motivated me out of my writing slump and has me so caught up? 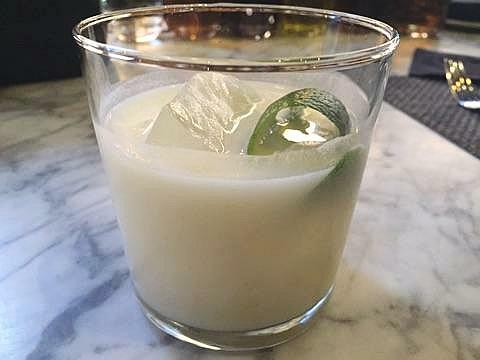 On the cocktail menu, it's listed as the Curry & Milk, comprised of gin, lime, lychee milk, pistachio, basil, and curry tincture. This is not your average drink; this isn't a classic, nor is it a trendy cocktail some hot-shot mixologist would put on the menu. The ingredients alone tell you that this drink is in a league of its own. Lychee milk? Pistachio?! CURRY TINCTURE?! It's not every day you run into a bar manager/staff with the balls to put a tincture on the cocktail menu, so you know it must be good! Imagine if a Thai iced tea crossed paths with a mango lassi that, rather than being made with mango, was instead made out of a sort of sweetened tikka masala/basil curry base. It's the kind of drink that transports you to some remote island in the Indian Ocean every time to have a sip. It's a sunny but slightly overcast day, a breeze cuts through the humidity and hits your cheek, while subtle smells of garam masala, fresh herbs, and lime float in the warm, beachy air. Are you there? Can you taste the grounded, earthy notes of the cocktail in your hand? Are you soothed by the milky texture and surprised at how you can drink such a creamy concoction without feeling overly full? Are you picking up on those bright tropical tones that keep you feeling refreshed? This cocktail seems like it comes from a magical island that has no real origin, but seems to exist in its own bubble in the middle of SOMA traffic, honking horns, delayed cross-town buses, and the massive herds of commuters making their 5:30 migration to BART. It's a bubble I want to stay in, and an island I'd visit daily if I could. I may have to learn to deal with my cravings, and I may just need to accept the fact that I can only visit the imaginary island at Mourad once every few weeks. But, I'm happy just knowing that no matter how hectic life gets in SF, I'm just a hop, skip, and jump away from tasting the tropics and taking a delicious time-out from my daily routine. Paragon huh? Of What? Mediocrity? Don't Even Act Like I Don't Cook Wild Mushroom Crepes. I Got the Recipe Right Here.